A cutter deck is at the heart of any garden tractor and Westwood provide a range of decks in different sizes to meet almost all cutting conditions. Built to professional standards, the new XRD is a tough, rear discharge and rough cutting deck. It features three contra-rotating cutting blades which ensure a clean, precise and complete cut – even when the grass is wet. The hardened-steel blades throw the clippings to the rear of the deck, ready to be swept up by the brushes of the Powered Grass Collector. 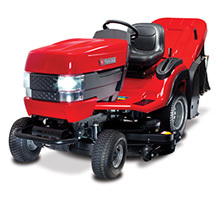 V Series tractors are fitted with large 127cm (50") IBS rear discharge decks. The Westwood range of High Grass Mulching decks are highly versatile. They can easily tackle tall grass, nettles or brambles as well as producing a fine finish on a formal lawn.